Southampton, PA — SUSDocs.org is a new site devoted to educational, technical and informative documents relating to single use/disposable systems used in the pharmaceutical, biopharmaceutical, and bioprocess industries. Information on the searchable site is provided by BPSA (BioProcess Systems Alliance), ASME-BPE (American Society of Mechanical Engineers-Bioprocessing Equipment), PDA (Parenteral Drug Association), ASTM International and ISPE (International Society of Pharmaceutical Engineers). The website was developed following an industry meeting on single use systems where the attendees, including the associations above along with several equipment manufacturing companies, commented that it would be helpful if data regarding single use systems could be found in one place. The attendees agreed, decided to make it happen and SUSdocs.org was initiated. Because the site is a resource for visitors seeking information on SUS technology, content is screened to ensure its suitability. All documents must be unbiased, informative and educational. Most documents are quite technical in nature, and supplier submissions that commercialize products or services are not accepted. The site is intended for the good of the industry. 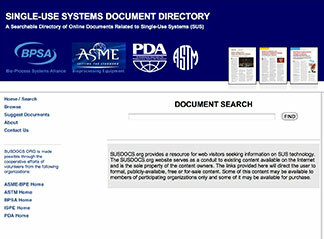 Visit http://www.susdocs.org, the Single Use Systems Document Directory, to explore more. Document suggestions are welcome. SUSDocs.org was created, and is maintained and hosted, by the AdvantaPure® division of NewAge® Industries, Inc.